Keeping you informed Have a Question Not Listed? SRE have been in the height safety industry for over 20 years. We have experienced many industries including commercial, heavy industrial, mining, offshore, government and residential. SRE are not product specific. We are not trying to sell you a certain product from a certain manufacturer. 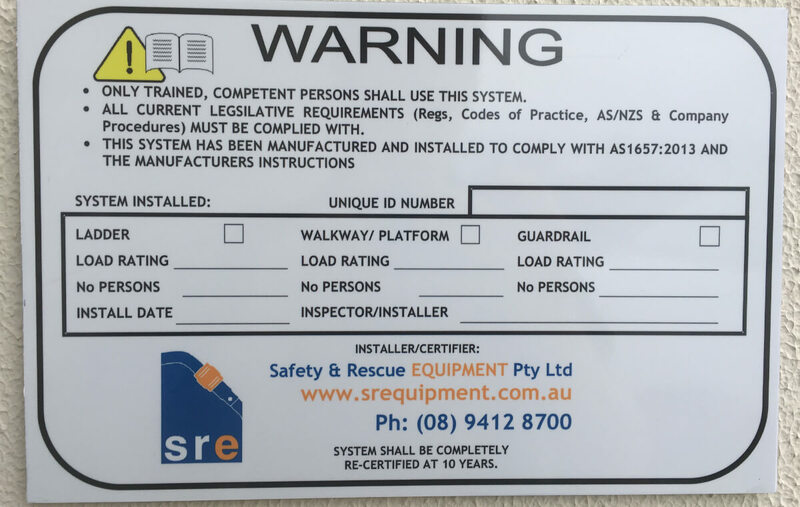 SRE’s aim is to help you comply with your obligations under current legislation and to make a safer workplace. We do this first by comparing where you are up to with compliance. Then we recommend whatever solutions are needed to assist you to make working at heights safer. We guarantee that you will get a ‘legislative’ answer from SRE. It will not be our opinion, it will not be a solution based on a certain product. It will be referenced (where possible) from a ‘legislative’ source (eg: Act, Regulation, Code of Practice or an Australian Standard). How often should I get my anchor points inspected? 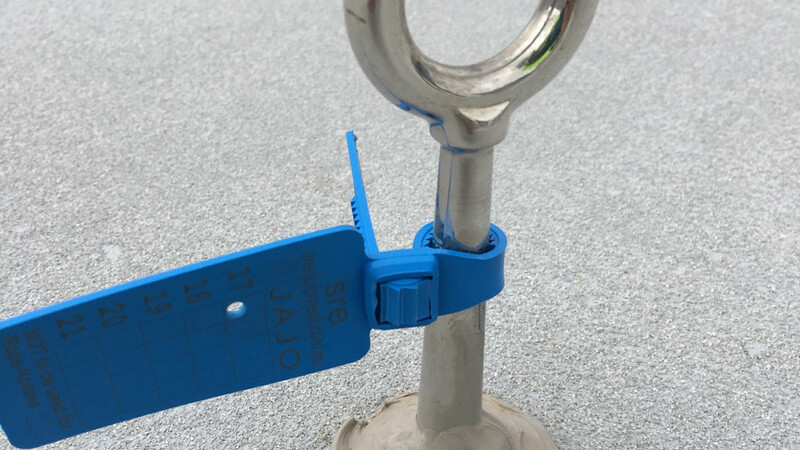 There is a common misconception in the industry that arranging an annual inspection of your Anchor Points keeps them ‘in-date’ and usable year-round. This concept is based on Australian Standard AS/NZS 1891.4:2009, however Standards are guidelines only - they cannot be enforced unless a Regulation requires a particular Standard to be followed. So what does Legislation actually mandate? My Anchor Points are rarely used, so can I just get them inspected once a year? 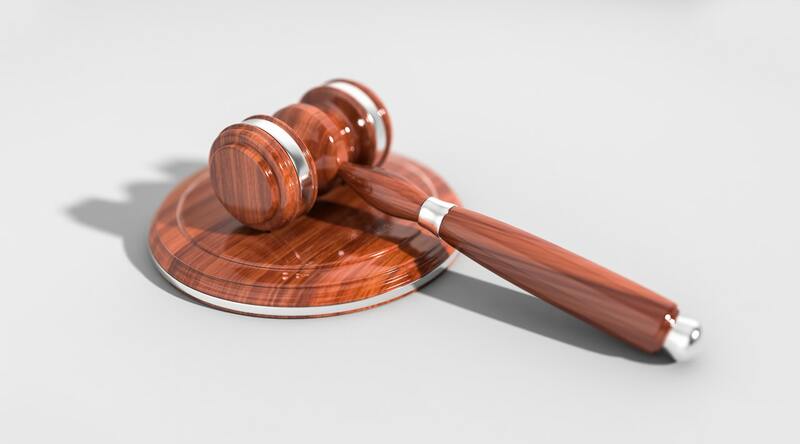 Arranging an annual inspection is fine, but there is nowhere in Legislation that then permits that Anchor Point to be used more than six months after inspection. 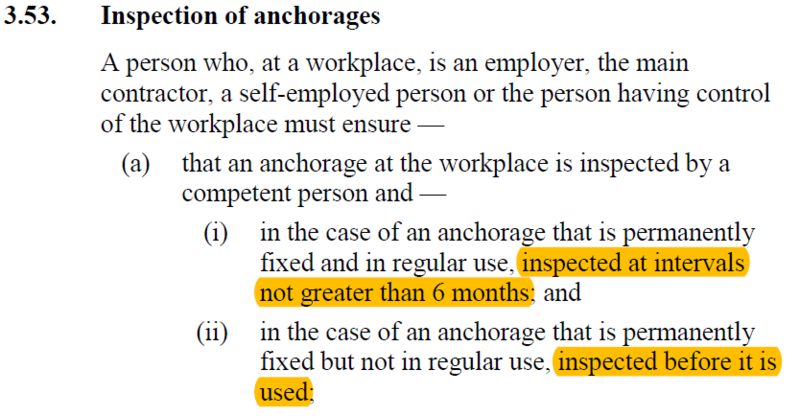 The law affirms that if it has been longer than six months since any Anchor Point has been inspected – then it should be considered off-limits, until an inspection has taken place. To comply with WA Regulations then, most property managers implement a 6-monthly inspection regime to ensure their Anchor Points are kept ‘in-date’ and usable year-round. Doing this ensures safe access to a roof can be quickly achieved in the case of an emergency (eg roof leaks, storm damage, blocked gutters etc), without the need to arrange a formal inspection first. 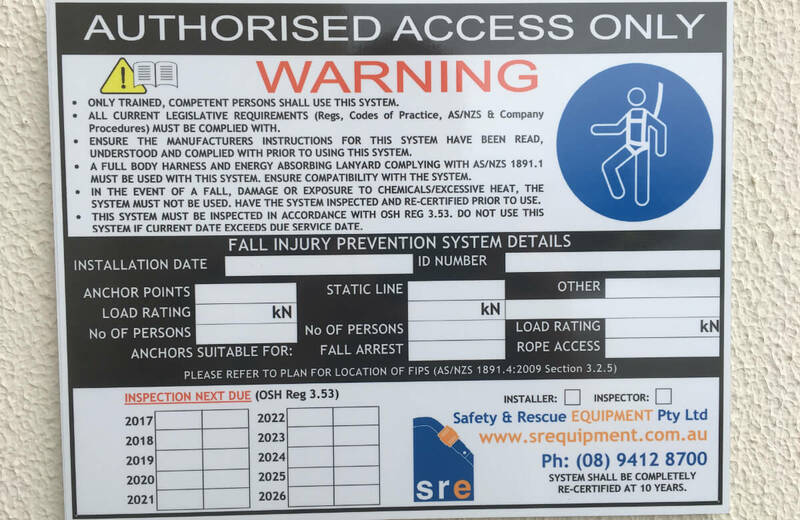 What documentation should I receive upon handover of my height safety systems? How does this affect the inspection process? The number of reports from Installer Category members on the sighting of incorrectly installed single point anchors has increased dramatically in the last few months. Common complaints include the anchor not being fixed correctly - and exactly in line with - manufacturers instructions. Incorrect fixing includes both the use of insufficient fixing points on the anchor or using an incorrect fixing method (e.g. tech screws instead of rivets). It is absolutely critical that the system owner or facility manager retains the system file. This file should include details of the planned work to be undertaken on the system, the work method statement on which the layout design was based and any design calculations. The file should also include the manufacturers fixing instructions and the test certificates provided by the system installer. It is also good practice for the system owner to maintain system usage records. The system file needs to be made available to any inspector / re-certifier requested to inspect and recertify the system. The re-certification process cannot effectively be done correctly without the system file information. No. No Australian Standard is retrospective (ie: can be applied to products or systems before it was published). Note also that Standards are not necessarily required to be complied with. View the Australian Legislative Framework Summary for more information. What must height safety anchors comply to? All height safety anchors must comply with this law. To claim compliance to this law, dynamic test certificates must be provided by the installer upon handover of the anchor point. These dynamic tests should consist of dropping a 100kg weight from a height of 2m whilst connected to the anchor. If the anchor is able to withstand these forces, it can claim compliance to this law. Including the afore mentioned testing (and certificate proving thereof), installation manuals are required to properly inspect anchor points. Without these manuals, we are in the dark as to certain requirements, such as the fixing methods allowed, number of fixings required, directions the anchor can be used in etc. What signage do I need for anchor points? Name of installer and installation date, or if an existing structure has been certified, the name of the certifier and the certification date. The highest purpose category in Table 3.1 for which the anchorage is suitable. The ultimate strength rating if less than 15kN. In this case words to the effect that the anchorage is not to be used for fall-arrest shall be added to the sign. The maximum number of people (not more than two) who are permitted to be connected to the anchorage at any one time. If an anchorage point is to be used only for a period of less than one month and is not therefore labelled, it shall be removed as soon as it is no longer required. At permanent installations the information shall be shown either on a sign located at each anchorage point or alternatively, on a plan prominently displayed at the entry to the area. 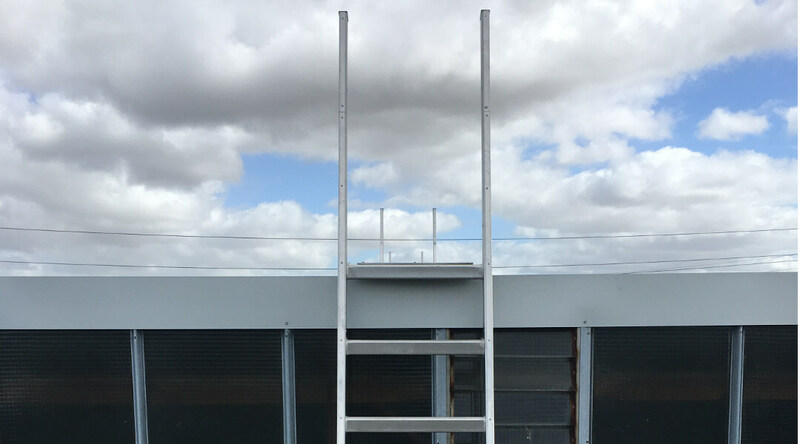 What documents should I be supplied with upon handover of my ladders, guardrails or walkways? What signage do I need for ladders, guardrails and walkways? The label shall be of a size that is clearly legible for the expected life of the installation, and shall be durable and suitable for the environment in which it is to be located, with an expected minimum life of 7 years. Where the installation does not comply with this Standard, a statement detailing the area of non-compliance shall be included on the installation certificate. Where non-compliance exists, it shall be accompanied by an additional label stating the non-compliance.